A quite unwelcoming sight for Maccabi Tel Aviv players. Maccabi Tel Aviv forward Jake Cohen tweeted a picture showing a sign with the notorious for its connection with the Nazis “Arbecht Macht Frei” phrase written on it, that was posted in the hotel where the team resides in Istanbul ahead of Thursday (6/12) EuroLeague game vs. Turkish side Darussafaka Tekfen. “Very curious as to why this sign was posted in our Istanbul hotel. #WeRemember,” Cohen wrote. 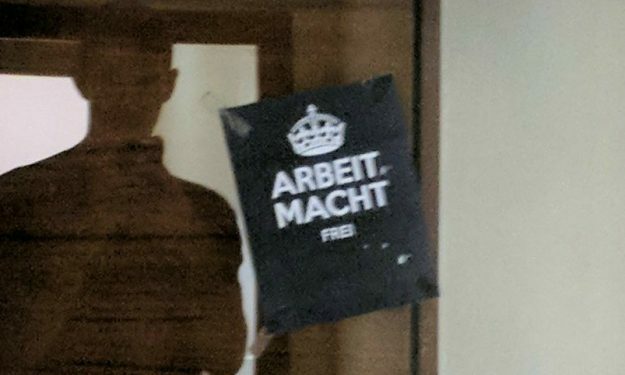 The “Arbecht Macht Frei” (“Work makes you free”) phrase was used on signs at entrances of various concentration camps (including Auschwitz) during World War II. Cohen, an American-Israeli player and a member of the Israeli national team, also mentioned that he saw the sign as he and his teammates were heading for dinner.